This canvas is a good example of a genre that became very popular in the eighteenth century, particularly among Venetian artists: the veduta, or view. Paintings of this sort were commissioned or purchased by English travellers or art-lovers. Francesco Guardi, who was strongly influenced by Canaletto’s idealised views of the city, generally made preparatory drawings for his paintings; the Museo Correr in Venice holds a large collection of his sketches and notes. 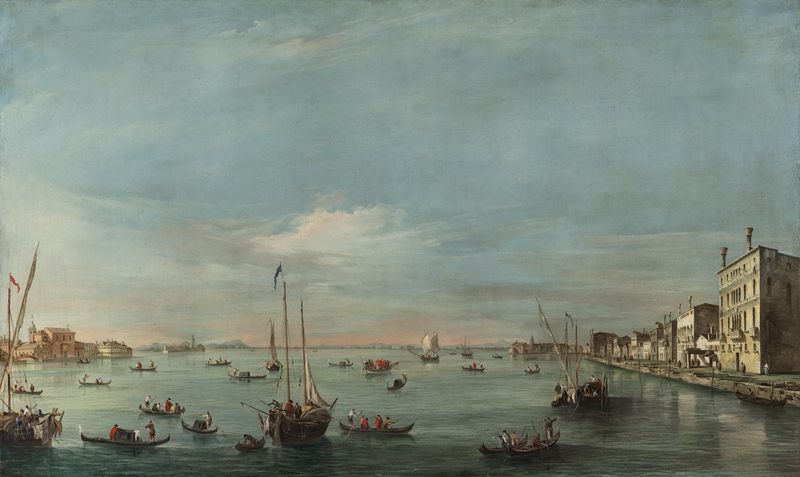 Here, Guardi provides a view of the Giudecca Canal, the waterfront promenade of Zattere, the churches of San Biagio and Santa Marta, and the Euganean Hills rising up in the distant background, behind the island of San Giorgio in Alga. The use of light and colour are characteristic of eighteenth-century Venetian painting. A variety of boats move through the waters of the Giudecca Canal, which stretches into the distance to the heights of the Euganeian Hills. On the right the Zattere can be seen from the Fondamenta del Ponte Lungo to the tip of Santa Marta, at the left a section of the Giudecca, with the destroyed church of Saints Biagio and Cataldo (the former Mulino Stucky now stands in their place), and the island of San Giorgio in Alga. Scholars have established that the paintings of Venice that owe their existence to English patronage can be divided into three distinct groups: the first, with five paintings including this one, belonged to Baron Henry Fitz Walter until 1931; a second group of six paintings is still in the collection of the Duke of Buccleuch at Bowhill House, while two others were part of the Sondes Collection at Lees Court. There seems to be no doubt that the right part of the canvas, showing the section of the Zattere, is based on a drawing by Guardi formerly in the Chennevières Collection (London, Christie's, 25 June 1974, lot 197), which, however, differs from our painting in its wider depiction of the riva, and also by the inclusion of a low building at the far right separated by a small street from the Ca' Zorzi, neither of which are shown in this painting. It should be noted that of the church of Santa Marta, which is visible in the distance, only the exterior has survived, located in the port area of the city quarter of the same name, the most western part of the city and a sort of paradigmatic proto-industrial zone. The same drawing was probably used for the other two vedute which are very similar to the present painting and, like it, are also signed (Buccleuch and Sondes Collections). Both are derived from the Thyssen prototype, and are, so to speak, continuations of the panoramas which did not yet include one of the most famous examples of architecture of the Venetian Settecento, the church of the Gesuati, built after plans by Giorgio Massari between 1723 and 1736. In the absence of a secure chronology for a good part of Guardi's career, Morassi proposed a fairly early date of c. 1745-1750 for part of the three groups of "English" works, while Succi suggested a later date of c. 1750. More precise dates can be inferred from the overlapping visits of collectors on their Grand Tours around the 1750s. Sir Brook Bridges, for example, the only ancestor of Lord Fitz Walter to have had an interest in art, went on his Grand Tour between 1757 and 1760; his presence in Padua (and thus probably in Venice) is documented in June 1757. He posed for Batoni and Mengs in 1758, the same year that another Englishman (John Montagu, Lord Brundenell, later Marquis of Monthermer, who probably bought the six paintings by Guardi that later passed to the Buccleuch Collection) was painted by both artists. Montagu remained in Venice from September 1758 until early 1760, and we cannot fail to mention that he commissioned Antonio Joli, possibly in 1757, with a series of thirty-nine views of Italian and French cities where he stayed during his Tour, as well as two views of Vesuvius and the Neapolitan coastline by Carlo Bonavia (the first of these dated precisely 1757). Given that four of the views by Guardi which were in the Bucchleuch collection are still in the Montagu residence at Bowhill, along with sixteen of Joli's topographical views and the one of the Neapolitan coastline by Bonavia, it seems logical to relate the name of Lord Brundenell to them, assuming the likelihood of relationships between the various English collectors who made the Grand Tour. Another link to these dates and this small group of Englishmen is the provenance of Lees Court for the two versions of another unidentified portrait by Batoni (which Clarkdates around 1758), i.e. the same collection in which we find the smaller version of Francesco Guardi's Giudecca Canal. It can thus be suggested that the Thyssen canvas (which is certainly not dated too late, but is instead inspired by Canaletto) and both pictures which originally went with it were commissioned in 1757 or at the beginning of 1758, and the ones in the Buccleuch Collection in the September of that year.